Well that wasn’t easy. Staring down a chance to put this round’s qualification in the rear-view mirror, the United States instead flirted with disaster, while at the same time leaving supporters with spinning heads. Taking all six points from both Guatemala City and Columbus would see the Yanks into the Hex with games to spare. However, after dropping the initial match of the series, Jurgen Klinsmann’s side faced the very real possibility of being all but eliminated from the 2018 World Cup. Luckily, with veterans Michael Bradley, Clint Dempsey and Geoff Cameron leading the way, the U.S. avoided disaster with an emphatic win Tuesday night in Columbus. The 4-0 victory came at just the right time, a time in which even the most fervent Klinsmann supporter began to call for the German’s head. Friday night’s performance was the last straw for many American fans. 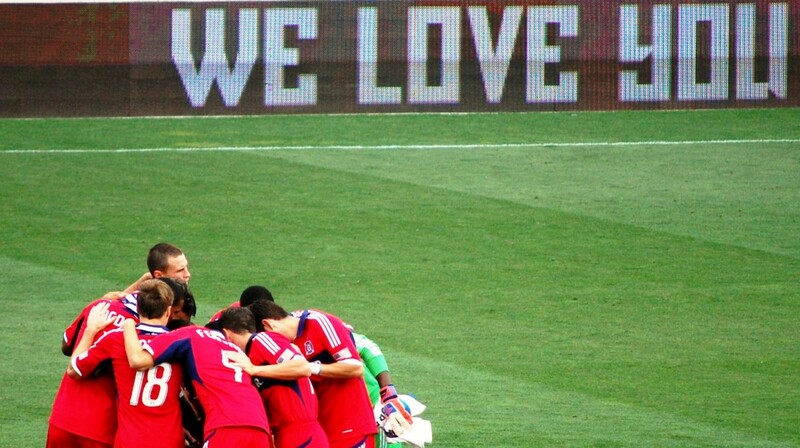 The 2-0 defeat, with Carlos Ruiz roaming the open spaces created by a disconnected U.S. back line, caused many to publicly question the U.S. program, from Sunil Gulati to the kit man. Detractors openly wondered whether the U.S. fans are merely detached from reality and asked why supporters should be expecting more. After all, while the U.S. team has supposedly improved, so has the rest of CONCACAF and the Stars and Stripes have truly done nothing in the past to warrant an attitude of entitlement. While the the scoreline could be understood, after all road CONCACAF matches are notoriously difficult, it was the lineup and overall play that frustrated the most. Sure, there is an unearned sense of entitlement among many fans, however, everyone has come to expect an increase in performance, one that was not seen in Guatemala City. Edgar Castillo looked lost, Michael Orozco hasn’t been playing with Tijuana and it showed, Geoff Cameron is a well-known central player, yet was playing out wide. Granted, Klinsmann was handcuffed by the late injuries of John Brooks and Matt Besler, but the high expectation is warranted. Many times it has been said this is the deepest USA pool in history, therefore such late injuries should not derail the effort. The X’s & O’s are not worth diving into, the only takeaway is the trip south was a catastrophe. The team headed to Columbus knowing that a second loss within a week would lead to the need for a miracle to advance in qualifying. Luckily for all involved, this scenario seemed to grab everyone’s attention. The Americans came out on fire, like a Mapre Stadium scoreboard, with the tone being set when lineups were announced. Jumping off the page were the three forwards Gyasi Zardes – Clint Dempsey – Bobby Wood starting up top. Clearly Klinsmann wanted goals and 12 minutes in he got one. From the initial kick off, it was easy to see the strategy was put pressure on the Guatemalan defense. Fullbacks Edgar Castillo and DeAndre Yedlin we pressing forward and the central midfielders had a license to roam free. Say what you will about Kyle Beckerman, he’s very much a security blanket in front of the central defenders and, in Columbus, allowed Michael Bradley and Graham Zusi to push up the pitch and feed the front three. In the end, goals by Dempsey, Cameron, Zusi and Jozy Altidore (not to mention hometown Crew SC boy Ethan Finlay getting CONCACAF’d on a clear-as-day poor offside call in the second half, after slotting one home), the Yanks walked away with a comfortable victory. Doling out credit where due, the veterans clearly took matters into their own hands and it was evident the result from the previous Friday embarrassed them. With the contest no longer in doubt, the story lines continued to form. In the 72nd minute, captain Michael Bradley picked up a yellow for a seemingly clumsy challenge. The caution rules Bradley out of the next qualifier due to yellow card accumulation. Happier times in the 81st minute, as the Columbus faithful got to welcome 17 year old Christian Pulisic to the Stars and Stripes. The teenager had been playing regular minutes for Borussia Dortmund and is seen as yet another savior of the program. The cap-tying is significant as Pulisic does hold a Croatian passport and could’ve opted to play for the European nation. So what now? Qualification picks back up in September with a trip to Saint Vincent and the Grenadines and a second chance to move onto the next round. Another victory against the Caribbean nation (the U.S. tallied a 6-1 win in St. Louis back in November) coupled with a Trinidad & Tobago win against Guatemala sees both victorious nations through to the Hex. The triumphant teams would then face off four days later in a mostly meaningless matchup in Jacksonville to close out this round of World Cup Qualification. Prior to that (and after a couple of typical money-grabbing friendlies), the United States will be participating in the Copa America Centenario this summer against some of the most prestigious players and teams world soccer has to offer. Be sure to stay close to OTF Soccer as the tournament unfolds for perspective from several of the competing nations. Follow @OTFSoccer for continuing USMNT coverage all the way to Russia 2018.